What is it that you’re e-commerce store selling? Digital or physical goods? It makes all the difference when thinking about shipping costs, etc,. Look for platforms that suit your product needs. We have worked with all the major platforms but especially like modern systems like Stripe and Braintree as they offer some many options and integrations including repeat/subscription models. If you wish to have a killer design to your store, look for platforms that will enable you to have a self-hosted version. Most eCommerce platforms provide the ability to modify your store within a live environment but some are restrictive. Self-hosting also allows you to modify the platform to fit your business processes. Shopify for example works perfectly if you wish to sell in the way they allow, if you want a break or new process in the sale then it might not be the platform for you. APIs are used to connect the site to other web or office systems may use now or in the future. We have connected our sites with various platforms including Brightpearl, TradeGecko, Salesforce, Insphire and Barcoder. Devstars specialise in the following platforms, please click through to read more on each, better still, call us now to get going! Need a very special selling process or do you sell a product that is not just a standard T-Shirt or Light Bulb? No problem. Devstars can create just the store and connect it to your accounting and warehousing platforms so you can concentrate on running your business. The best part of bespoke carts is your site is going to do EXACTLY what you want it to, it will also be super-optimised, giving you fast loading pages and happy customers. Examples of our Bespoke Carts are found with the following clients. Cutler and Gross – International sales of high end Frames and Sunglasses. Many custom plugins including Geo-targeted content, Try on at home service and lighting fast 360 images. We wrote an article comparing bespoke, Woo, Magento and Spotify here. 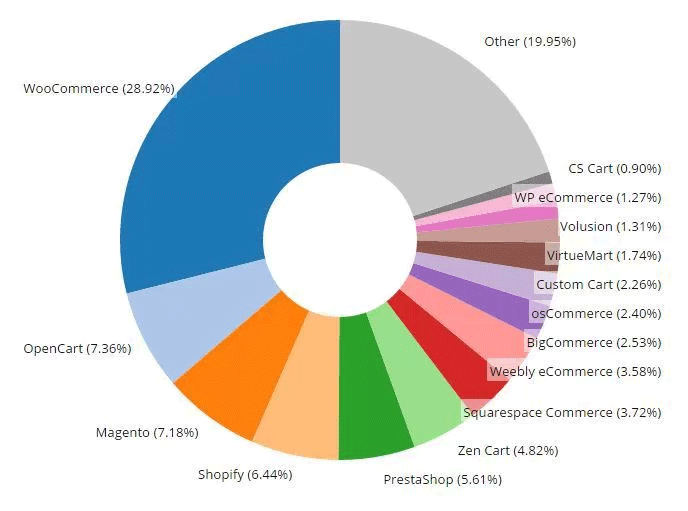 With 11,729,225 downloads WooCommerce powers over 30% of all online stores. In the UK it is our favourite platform now (see 2015 chart below). Woocommerce is built on WordPress and offers a seamless store/shop experience with all areas of your site administered from a central panel. Using a mix of Multi-site and WordPress Multi-language extensions, you can quickly set up a store to sell across borders with options to have multi-warehousing and payment gateways to suit your business. We like using Woocommerce due to a mixture or great documentation, huge open source community, endless connectivity (webhooks, Rest API, Custom Ajax endpoints) and simple migration from your old platform.